Special Counsel Robert Mueller walks past the White House, after attending St. John's Episcopal Church for morning services, Sunday, March 24, in Washington. Mueller closed his long and contentious Russia investigation with no new charges, ending the probe that has cast a dark shadow over Donald Trump's presidency. WASHINGTON — Special counsel Robert Mueller did not find that Donald Trump or his campaign schemed with Russian efforts to interfere in the 2016 presidential election, according to a summary released Sunday that the president immediately embraced as a “complete exoneration” even though Mueller reached no conclusion about whether the president obstructed justice. “The Special Counsel’s investigation did not find that the Trump campaign or anyone associated with it conspired or coordinated with Russia in its efforts to influence the 2016 U.S. presidential election,” says the four-page summary by Attorney General William Barr. “It’s a shame that our country had to go through this, to be honest it’s a shame that your president has had to go through this,” Trump said. “The Special Counsel … did not draw a conclusion — one way or the other — as to whether the examined conduct constituted obstruction,” Barr’s letter to lawmakers states. “The Special Counsel states that ‘while this report does not conclude that the President committed a crime, it also does not exonerate him,’” the letter says, signaling that Mueller’s team apparently struggled with the issue. 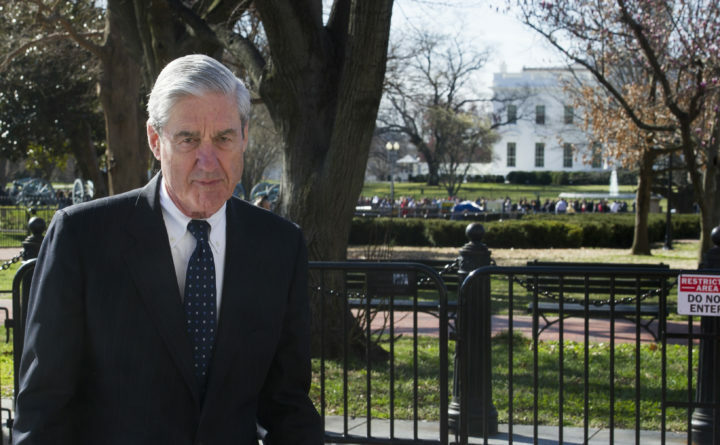 Mueller “ultimately determined not to make a traditional prosecutorial judgment,” Barr wrote, leaving it up to the attorney general and Deputy Attorney General Rod Rosenstein to decide whether the president had committed obstruction. The highly anticipated summary of Mueller’s investigation was sent to Congress on Sunday. Over four pages, it described in broad terms Mueller’s work. Top Democrats Nancy Pelosi and Chuck Schumer urged full release of Mueller’s report. Since his appointment in May 2017 as special counsel, Mueller has also wrestled with the question of whether the president attempted to obstruct justice once the FBI began investigating those close to him. Current and former White House officials who were questioned by Mueller’s investigators were repeatedly asked about how the president spoke of the investigation behind closed doors, and whether he sought to replace senior Justice Department officials to stymie the probe, according to people familiar with the interviews. A senior Justice Department official said the special counsel has not recommended any further indictments — a revelation that buoyed Trump’s supporters, even as additional Trump-related investigations continue in other parts of the Justice Department, in Congress and in New York state. Washington Post writers Felicia Sonmez, Paul Sonne and Drew Harwell contributed to this report. The Associated Press contributed additional reporting.